Garden Embroidered mom jeans by Topshop – £68 A little pricy for the high street but these are my absolute favourite! 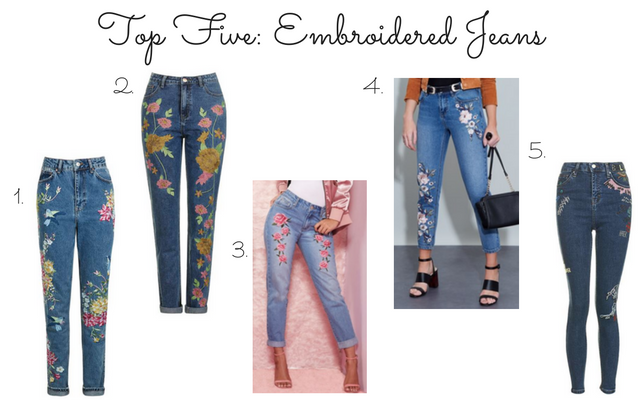 The fun, floral embroidery is sprinkled across the jeans, front and back for a real style statement. I love the mom fit too. Embroidered jeans by Glamorous – £39For those who like overt embroidery, these jeans are you. I love the bold embroidery on one leg and smattering on the other, however I would have liked them more if they had a touch on the back. Embroidered jeans by Pretty Little Thing – £28 These jeans are absolutely perfect if you’re not 100% convinced by this trend but want to dip your sartorial toe in it. There’s only a touch of embroidery and the price tag is so tiny it justifies the investment. Embroidered jeans by Anita & Green – £35 In a more muted tone than some of the other jeans I’ve picked, this cute cropped pair by Anita & Green would look great with a pair of stilettos and a white shirt, elevating your wardrobe basics. Moto scribble embroidered jeans by Topshop – £55I have to admit, I prefer embroidered jeans with a looser silhouette, but these skinny jeans have such a ‘don’t care’ attitude I actually really like them.